Shugborough Hall in Staffordshire is an English stately home with a difference. It’s a lovely place to look around, but for many it’s also a place to go to learn about its last significant resident, Lord Lichfield. Patrick Anson was the 5th Earl of Lichfield, relative of the Queen, world famous photographer and mover and shaker in the 60’s and 70’s and this was his ancestral home. When he lived here he didn’t actually own the hall, death duties had meant it had had to be sold to Staffordshire County Council – they run the site in conjunction with the National Trust. However, until his death in 2005 he still lived in the private apartments with his family (and dogs) in return for a pepper corn rent. Until recently when you went around the house you just saw the traditional state rooms, ie the ones not used all the time by the family – the sort you tend to see in every stately home of its ilk. In the last couple of years though, they’ve managed to secure permission to open up Lord Lichfield’s private apartments for the public to see. For us this was the really interesting bit. You got to see where the man who photographed Princess Diana, had parties with Mick Jagger and romanced Brit Ekland actually lived. Although most of his furniture has gone, the place is littered with his famous photos along with some of his clothes and belongings. A particular highlight was the tiny bar slotted in under a stairwell. We were fortunate enough to go on a tour of the private apartments with a guide – this really brought the whole thing alive, however you can go on a self guided tour at other times. If you remember this man and the colourful life he led, you will love going to Shugborough Hall. It’s not just about the hall though. You can pop over to the servants quarters where the cooking staff and porters will regale you of their lives there decades ago (they really try to get in character) as well as the farm yard and craft village. We last visited early spring, but in summer when the flowers are out, the garden is a sight to behold too and you can enjoy the walk along the river that runs past the rear of the hall. 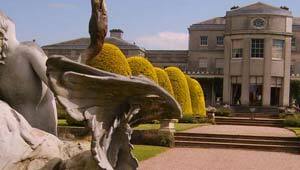 The Shugborough estate is open from March to October each year. The Mansion House (Shugborough Hall) opens Wednesday to Monday, with free guided tours from 11am to 1pm and general opening from 1pm to 5pm. The grounds, tea shop and gardens open every day. Adult admission for everything is £15 (2013 prices) and you get your car park fee refunded. Shugborough is just 4 miles from Stafford and is signposted from J13 of the M6. The main entrance is located at Milford Common on the A513.